SkyTeam, the global airline alliance, is giving the gift of travel this season by offering customers a 15% discount off their Round the World trip. The promotional fare is available for both economy and business class tickets of up to 26,000 miles purchased between now and March 31, 2017. SkyTeam, the largest airline alliance in Greater China, has launched its Corporate Agreements product in the region, delivering value through tailor-made travel solutions designed for every organization’s individual needs. SkyTeam, the global airline alliance, has offered a preview of its latest lounge which will open at Beijing Capital International Airport in the coming weeks. The second SkyTeam-branded lounge in the Greater China region and the sixth worldwide, it will offer a luxurious pre-flight experience complemented by high-end amenities for First and Business Class passengers and Elite Plus members flying on any of the 12 SkyTeam airlines serving the airport. SkyTeam’s SkyPriority Customer audit program has been awarded silver in the annual Research Effectiveness Awards 2016 by ESOMAR, the essential organisation for encouraging, advancing and elevating market research worldwide. 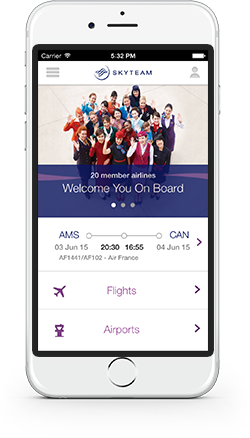 SkyTeam, the global airline alliance, has added further enhancements to its Global Meetings product, a dedicated travel solution for the Meetings Industry, to make arranging travel to international meetings and events easier than ever. SkyTeam, the global airline alliance, will deliver increased customer benefits and more codeshare opportunities for members throughout 2016. SkyTeam, the global airline alliance, today officially opened its latest lounge at Dubai International Airport. SkyTeam has again been awarded ‘Airline Alliance of the Year’ in the latest Air Transport News Awards that took place in Salzburg, Austria on Saturday, March 26th. SkyTeam, the global airline alliance, has announced a partnership with UNICEO®, the international association for senior corporate event organizers. The tie-in further position’s SkyTeam’s Global Meetings product as a competitive and convenient travel solution for the MICE (Meetings, Incentives, Congresses and Exhibitions) segment, a priority for the alliance and its 20 members. SkyTeam, the global airline alliance, is offering customers more of the world for less, with a 10% discount off Round the World fares in 2016.